We’re not talking about those things to which you lock your bike outside of a store or the contraptions you bolt to your car to haul the bike you should be riding. No, we’re talking about a rack that fits onto your bike, most commonly known as a bike cargo rack. Bike racks are something of an oddity in this day and age, when sport and recreation bike marketing is all about lighter and faster. Bike racks actually [gasp!] add weight to your bike, which enable your bike to gracefully haul and handle heavy loads. The idea behind a bike rack is to get weight off your back and put it onto the bike. This can come in handy for long bike tours, car-free living, die-hard bike commuting, or just carrying gear in an efficient way while avoiding a sweaty back. Bike cargo racks can be broken down into two main categories: front racks and rear racks. A full setup can give you a carrying capacity upwards of 140 pounds. What a way to add purpose and versatility to your trusty, two-wheeled steed! Rear racks can generally carry more weight than their counterparts up front. Therefore most people who choose to have only one rack pick a rear bike rack setup. The rear racks utilize their top rail for pannier mounting, which raises the bike’s center of mass and changes its handling characteristics. Because of this innate design, it’s important to pack heavier items as low as possible to maintain good bike handling. For carrying full capacity loads, we recommend looking at rear racks like the Tubus Logo Rear Rack, and the Tubus Cosmo Rear Rack. These racks include lower mounting rails so you can mount your gear closer to your wheel’s axle for a more optimal, lower center of gravity. Front racks are great for smaller capacity panniers which can carry light, compact items like clothing, snacks, and bike tools. Front racks come in two flavors: top plate mounting racks and low rider mounting racks. Top plate mounting racks include a flat plate across the top of the rack and side mounting rails. The top plate gives you additional carrying capacity by allowing you to tie down small items, like a lightweight sleeping bag or extra water, to the top, while your panniers are mounted at the sides. The nature of the top plate design means that the plate sits above your front tire, so careful consideration needs to be taken when packing your panniers. The low rider mounting racks offer one pair of mounting rails for pannier mounting, and the weight is directly centered over the front axle, which places your weight at the most optimal position for balanced bike handling. This can be advantageous for heavier, expedition-class touring loads, although you can’t strap items to the top of the rack with this style. Bike commuters with smaller loads may be impartial to these differences considering light loads have an overall lesser effect on their bike’s handling. Just like most bikes, bike racks are typically constructed from different materials. Chromoly steel and aluminum are the most common and each has its own advantages. Tubular aluminum racks, such as those from Old Man Mountain, have high weight capacities and are lighter than steel racks. Commuter racks, are also typically made from aluminum, but they use solid struts which do add some weight to the racks, but they are still a good option for light commuting. Steel racks, such as the Tubus lineup, may weigh a tiny bit more than aluminum racks, but they have one significant advantage: steel is easy to weld and you can find someone in nearly every village or town around the world who can fix your rack. For the rack connoisseur, there are the flashy stainless steel racks and the super light titanium racks, as well. With a lineup like this, you are sure to find something that fits both your needs and style. Probably the most important question to ask when considering a rack is, Will it fit my bike? Chances are, if you don’t have disc brakes or a suspension fork, and your bike’s frame incorporates rack eyelets at the dropouts, the answer is, “Yes!” If this isn’t the case, don’t worry, you just need to do a little research, as only certain racks may work for your bike. There are plenty of accessories out there that allow you to retrofit your rack for sturdy mounting on a variety of different style bikes. Top Rail: Front racks with a top rail usually also have a top platform. This gives you more gear loading options but typically means a lower carrying capacity because of the weight placement. The upper mounting systems of bicycle panniers clamp to the top rail. Some front racks such as the OMM Ultimate Lowrider Rack have both top rails and low rider rails offering two positions for mounting front panniers. Top Platform: Front racks with upper platforms such as the OMM Pioneer Front Rack & OMM Sherpa Front Rack are constructed with a top platform that can be utilized for front rack-top bags or for strapping down items like dry bags or sleeping bags. Low Rider Rail: Low rider racks such as the Tubus Tara Front Rack offer a low mounting position for bike panniers. The advantage of this style rack is that the lower pannier mounting position results in less side-to-side movement from the pannier weight when the rider is out of the saddle or cornering. Top Rail: Most bicycle racks have a configuration that includes a top rail. 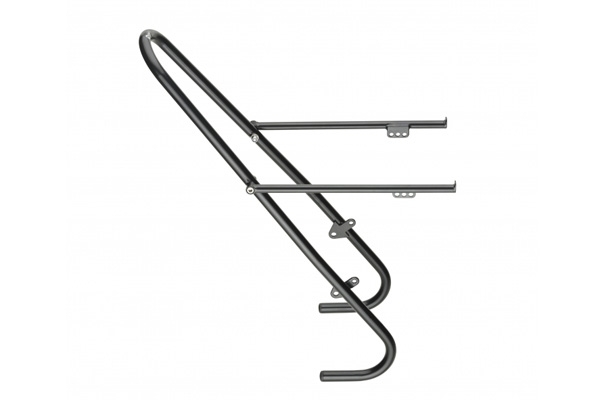 This top rail is utilized for attaching the upper mounts of bike panniers to the rack, as well as for placing rack-top bags on top of the rack. Top Platform: Bicycle racks will generally have either cross members between the top rails, a platform, or a combination of both. OMM Sherpa Rear Rack and OMM Pioneer Rear Rack racks have a very distinctive plate metal platform while the Tubus Cargo Rear Rack, Tubus Logo Rear Rack, and Tubus Vega Rear Rack all have cross members between the top rails but no actual platform. Low Rider Rail: The low rider rail is not common on rear racks. Racks that do have the low rider rail offer two distinct benefits for pannier mounting. First, it offers a lower position for the pannier weight, which is always advantageous for more efficient out-of-the-saddle riding. Second, it offers a more rearward positioning for panniers, and allows you to easily combine the rack top bag and pannier setup on the rack. Rear racks with low rider rails, such as the Tubus Logo Rear Rack, can be mounted further back on the lower rail to provide better heel clearance, as well. Top Mounting: There are a couple of ways to mount a rack to your bike. The most sturdy way to attach your rack is to utilize top mounting eyelets because then the rack is secured directly to the fork; however, not all forks are equipped with these mounting holes. Old Man Mountain racks are designed to be installed on the top part of the rack to a caliper-style brake boss system. These racks include an angle bracket to affix the mounting arms to the brake bridge. If eyelets and brake bosses are not an option, then additional hardware like the OMM Band Clamps may be needed. This part basically creates a clamp on each side of your fork, which acts as an eyelet. With multiple top mounting options, there will typically be a snug fit that works for your bike. Lower Position: Many bicycle’s front forks are built standard with lower mounting eyelets. For bicycle forks without lower eyelets, the lower section of racks (such as those by Old Man Mountain) interface against the bicycle fork’s dropouts. To secure the rack’s lower section, the standard quick release that normally locks the front wheel in place, is swapped out with an extra-long quick release that locks the rack against the fork while also locking the front wheel in place. Mid Fork Position: Some bicycle forks are built with a mid-fork eyelet to facilitate the installation of a front bicycle rack. A variation of the mid-fork eyelet is the mid-fork through hole. This rarer style is required for mounting the Tubus Duo Front Rack. For bicycles that do not have Mid-Fork Eyelets, adapter brackets can be installed. Tubus Mid-Fork Eyelets for Tara and Ergo are great for Tubus racks and are suitable for other racks as well. Old Man Mountain offers stainless steel clamps that can be also be used for mounting front racks to bicycle forks without mid-fork eyelets. Brake Bosses: The upper section of Old Man Mountain racks are designed to mount to caliper-style brake bosses. For front forks without brake bosses, utilize the OMM Band Clamps instead. Suspension Fork: Old Man Mountain racks are great for front suspension forks, installing to the forks dropouts and brake bosses (or with the OMM Band Clamps). Lower Position: Many bike frames are built standard with rear, lower mounting eyelets. For bicycle frames without lower eyelets, several options are available for mounting a rear bike rack. Tubus Rear Racks can be mounted with the Tubus QR Adapter. Similarly to OMM Front Racks, the lower section of OMM Rear Racks) interface with the bicycle frame’s rear dropouts. To secure the rack’s lower section, the standard quick release that normally locks the rear wheel into the frame, is exchanged for an extra-long, rear quick release that locks the rack against the frame while also securing the rear wheel in place. Upper Position: Most bicycle frames that have lower mounting eyelets also have upper mounting eyelets, though occasionally they will only have the lower eyelets. For frames without upper eyelets, several options are available. As with front racks, OMM’s stainless steel clamps can be utilized for securing the upper section of the rack. Tubus offers up their own Tubus Seat Stay Mounts for mounting Tubus Roundstays to frames without upper eyelets. 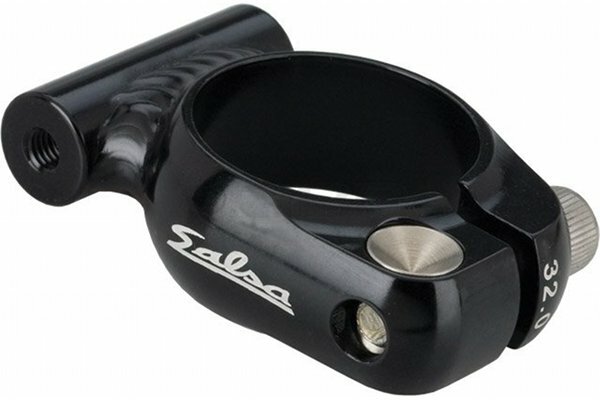 For bicycles with odd frame configurations, seatpost clamps such as the Sunlite Rack Mount Seat Post Clamp, Salsa Rack-Lock Seatpost Clamp, or Salsa Post-Lock Rack Mount can be utilized to provide an alternative to upper mounting eyelets. This upper mounting method is sometimes a preferred method when mounting bike racks to carbon fiber frames as opposed to utilizing OMM or Tubus clamps. Clamps do work fine with carbon fiber frames as long as any of the metal on the clamps is sufficiently buffered from coming in contact with the carbon fiber frame. Brake Bosses: The upper section of Old Man Mountain racks are designed to mount to a bicycle frame’s caliper-style brake bosses. For bicycle frames without brake bosses, utilize the OMM Band Clamps instead. Weight/Capacity – Front & rear racks: front racks range in carrying capacity from 25 to 50 pounds, while rear racks range from 35 to 90 pounds. When choosing your bike rack setup, part of your consideration should be how much weight you plan to carry and how you plan to distribute that weight. When you use both front and rear racks are used, the weight should generally be distributed equally front to back and right to left. You should always test and fine-tune your weight distribution before setting out on a ride. One Rack – Front vs. Rear Racks: When you only need to carry enough to fit on one rack, a rear rack is generally the most common choice as they offer the most mounting positions, they do not impact the steering of the bicycle, and their rack position is the most common. When using only one rack, some cyclists do prefer to use just a front rack because of the lower mounting position for bike panniers they offer. Light Mounting Options: Most rear racks are built with a rear plate or rail designed to interface with a variety of rear lights such as the Busch and Muller 4DToplight Permanent Bike Tail Light. Integrated Bag Mounting Rails: Several brands of bicycle rack manufacturers also manufacture bicycle bags. Some of these manufacturers design some of their bags and racks to integrate with each other. Old Man Mountain Racks : The OMM racks are top-of-the-line racks, intended to withstand many hours of riding with tons of gear. These racks fit most any bike, including bikes with rear suspension. Combine a front rack and rear rack from OMM, and you can carry 100lbs! Take the kitchen sink if you want with the durable OMM carrying systems. Adventure ready! Salsa Racks : These racks reflect the spirit of discovery and curiosity for which Salsa Bikes are known. Surly Racks : Well-thought-out, durable, expedition-worthy racks that work with most panniers. 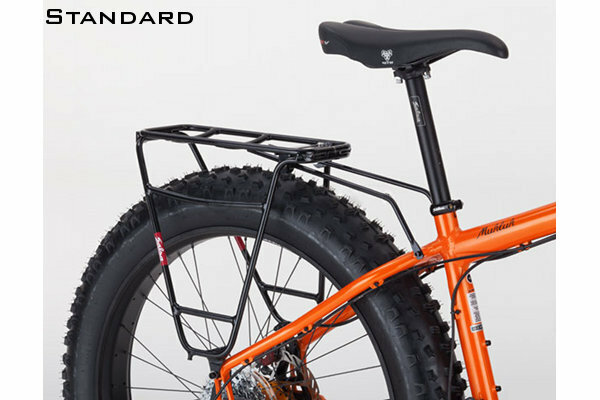 Designed for heavy-duty touring, Surly Racks stand also stand up to everyday utility cycling and commuting. Tubus Racks : Tubus offers a wide array of high quality racks for a variety of bicycling needs. These top-of-the-line carriers offer superior quality and great aesthetics for any touring or commuter bikes.